Event Registry is a system that can analyze news articles and identify in them mentioned world events. For each event it can extract from the articles the main information about the event (who, when, where, …). Information about the events is stored in the Event Registry and can be accessed through a website. The overall system architecture is shown in the top image. The collected articles are first pre-processed in order to identify the entities and concepts mentioned in the articles. Date references are located in the article text in order to determine the date of the event mentioned in the text. Articles with similar content in other languages are also identified using cross-lingual document linking. The articles and the information extracted from them are then used to identify events described in the articles. An online-clustering method is used to group articles that are about the same story. 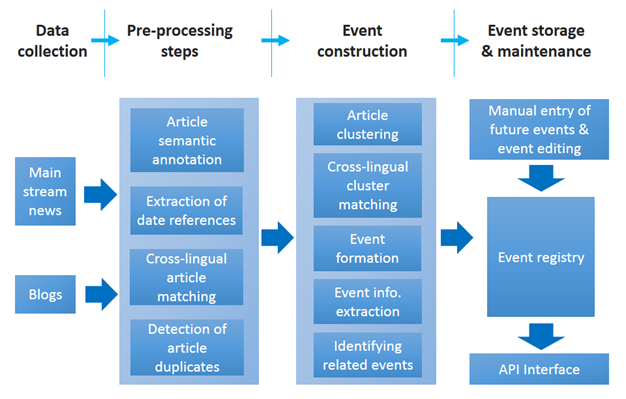 Using the cross-lingual article matching and other features of the groups we can also identify groups of articles in different languages that are about the same story and merge them into a single event. From articles in each event we then extract information about the event date, location and relevant entities. Extracted information about the event is then stored in the event registry. Event registry provides a user interface where users can search for events based on various criteria. Search results are visualized and aggregated on different ways in order to enable additional insights. The demo of the Event Registry service is available at http://eventregistry.org.